What if we could give birth to a global movement that will propagate contagious ideas and innovative projects that would lead to a healthier and fairer future for all? What if we could co-create a place in which anyone, anywhere, and at any time, could contribute to tackling some of the biggest inequities in health in the world? What if we could forge alliances across traditional boundaries, harnessing our collective talent and creativity, to create a pandemic of health? What if, together, we could make this happen? These questions are at the core of the re-invention and co-creation of the Institute for Global Health Equity and Innovation (IGHEI) at the Dalla Lana School of Public Health at the University of Toronto. IGHEI was founded in 2012 and is a university-wide entity that was transformed by “Creating a Pandemic of Health,” a Global Summit that hosted more than 750 attendees in person and hundreds of additional remote participants from across the globe in November 2014. 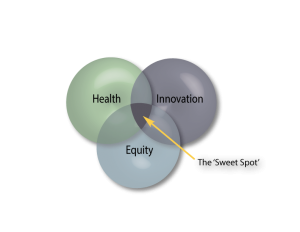 We focus on the ‘sweet spot’ at the intersection of health, equity and social innovation. Equitable creation and spread of health, not just the more traditional focus on the fight against disease and avoidable causes of death, must be the main purpose of public health. Accelerating this shift is more urgent than ever, now that humans are becoming an urban species plagued by non-communicable diseases, financial crises, social disparity, global climate change and ineffectual polarized political structures that are threatening the sustainability of the species. To create this pandemic of health, through activities seeking to create and spread health that complement efforts to reduce disease prevalence and eliminate avoidable causes of death, IGHEI focuses on the ‘sweet spot’, the intersection of three fundamental areas: ‘health’; ‘equity’; and ‘innovation’. “Equity in health” as the absence of systematic disparities in health (or in the major social determinants of health) between groups with different levels of underlying social advantage/disadvantage – that is, wealth, power, or prestige [Braveman and Gruskin, 2003]. “Innovation” as the process through which knowledge is transformed into significant positive change [Berkun, 2010]. “Social Innovation” A novel solution to a social problem that is more effective, efficient, sustainable, or just than existing solutions and for which the value created accrues primarily to society as a whole rather than private individuals [Phills et. al, 2008].